"I am packing for a trip to heven. The first thing I expect to see is my Grandma Madgge. The next thing I expect to see is my Grandfather. 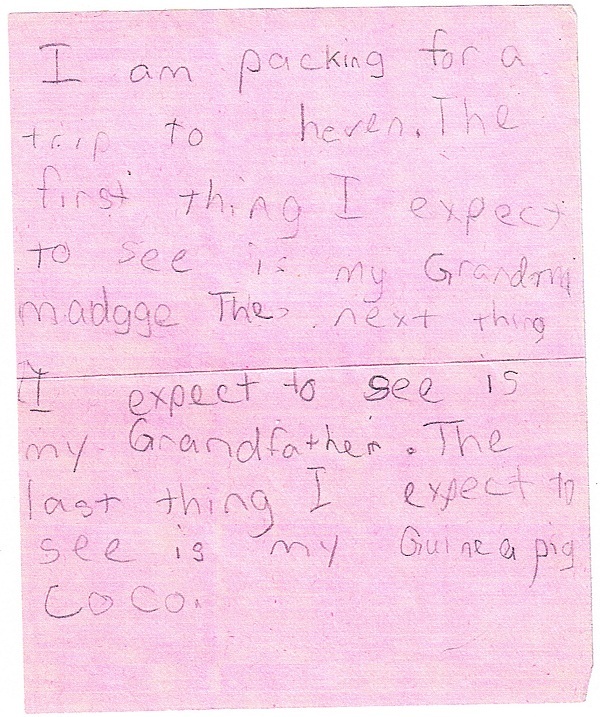 The last thing I expect to see is my Guinea pig Coco." Written by Michaela, date unknown. In the midst of the ribbons and balloons, the symbols of love and hope, yesterday I received a copy of this note. It was written on a little slip of paper, the size of a post-it note, and Michaela's dad had found it stuck inside one of Michaela's books that he had among his belongings. There is no doubt that Michaela wrote it. The handwriting, her unique spelling, and the formulaic writing that they had drilled into her in school, all mark it as Michaela's. I had never seen it before. Apparently she had written it to nobody in particular, and had stuck it inside a book. What motivated it? I don't know. It made my heart sink when I read it. I have resigned myself to the fact that I want a resolution to all this, that the truth is the truth and whatever it is, knowing it is better than not knowing it. But my resistance to the possibility that Michaela is not alive makes itself known in the heaviness of my heart every time I actually have to face something that might lead to that conclusion, as well as the lightness that overcomes me every time I am granted yet another reprieve from that, even though it means continuing to live without knowing. It is entirely possible that this was some random thing that passed through Michaela's head and landed on a piece of paper. (Goodness knows that would be an inherited characteristic here!) But odd, so odd, so very odd for a nine-year old girl to write something like this. There is one thing that I have absolutely no doubt at all about, and that is that Michaela had some inner foreknowledge of what awaited her. There was the poem she wrote in the middle of the night a week before she was kidnapped, which she said was about people who had been kidnapped. There was that odd, quirky fear she had of bathrooms. (If you are a regular reader of my blog, I apologize that all this is repetitive, but it is just so significant I can't help but repeat these things.) Whenever she went to the bathroom, she would literally beg me to go with her. In our house, if I was sitting on the couch in the living room, she could go into the bathroom and leave the door open, and keep eye contact with me the whole time, but when I told her that, she said that was not enough, and begged me to please get up off the couch and walk those few feet into the bathroom with her. I was reminded yesterday of that fear also. What did it mean? Ultimately, was something destined to happen to her in a bathroom? I don't know, I don't know what any of it means. But you add it all up, and it has to mean something. Actually, it is somewhat comforting. If Michaela had some foreknowledge of what was going to happen to her, then that means that there is a spiritual reality to our lives beyond what our five senses tell us. And somehow, what happened to Michaela fell into that spiritual reality. That means that it was not some random, meaningless event, but that it had some meaning, some purpose -- that there was something in it that Michaela knew, grasped, even accepted on some level, albeit reluctantly. I've said before that Michaela seemed to have some reluctance to come into this life, and seemingly some reluctance to stay here. I had to take fertility pills to get pregnant with her. She was induced almost four weeks early due to pregnancy complications, and as a newborn had a strep infection where the fetal monitor had been attached, which could have been fatal if it had not been caught. When she was an infant, I saw the only real, live black widow spider I have ever in my life seen, sitting on the head of her teddy bear next to her crib. When she woke in the middle of the night before she was kidnapped, and wrote her poem about people who had been kidnapped, she was just extraordinarily calm and accepting. Just this morning I was thinking about it, and I could see her face as she sat on the floor at the coffee table, twirling a pencil and looking at me, so placid and slightly amused in the face of my astonishment at this poem that had come out of this mere child. Placid and completely humble in that amused way, not at all impressed with her own achievement, or with the fact that other people were so impressed. Michaela said that she had written this poem about people who had been kidnapped, and were being held captive, like in the movie "The Peanut Butter Solution, which was a children's movie that involved a crazy artist who kidnapped people and made their hair grow so that he could cut it off and use it to make paintbrushes, with which he was able to paint pictures that were alive, so you could actually walk into them. It was in the wee hours of Saturday morning that she wrote this poem. 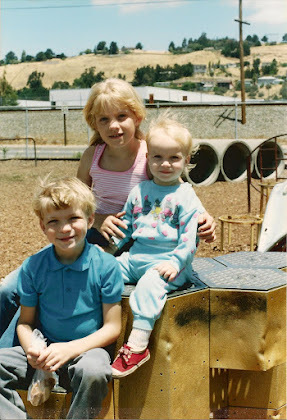 A week to the day later, Michaela became one of "the people who had been kidnapped." Even in the actual kidnapping itself, I could see this spiritual dichotomy of acceptance and reluctance. Michaela was lured to her kidnapper's side by a scooter, which had been moved from where it had been left outside the door of the market, to the side of his car. But when she and her friend left the market, they initially forgot that they had brought scooters. They completely overlooked the one scooter that remained by the door and started to walk home. To me, this was the final attempt by her little soul to escape something that on a different level she had foreknown and accepted since before she entered this world. But halfway across the parking lot, she remembered, and turned back to the fate we now know awaited her. It's a fact that those of us who have endured great suffering want to find a purpose to it. We want to know that there is some benevolent purpose in the universe that will help us to make sense of what doesn't make sense. We are determined that something good has to come out of it. It is for this reason that people found nonprofit organizations, write books, write blogs, speak out, in a determined effort to bring something good out of the worst that the universe can send. Depending on their orientation, people may set out to help find missing children, to cure diseases, to stop drunk drivers, to find and share a spiritual reality, or even just to help others who are suffering. And if our own suffering has involved losing someone we loved, we are driven to give their lives and their suffering meaning. But the fact that we have some innate drive to do this does not in any way negate the truth behind it. When we get hungry, we want to eat. Eating is not a meaningless way of rationalizing our hunger, though, is it? I don't believe that finding meaning and purpose in suffering is nothing more than a way of dealing with our pain. I believe it does have meaning. It does have purpose. We may never find it, may never fully grasp it or understand it, but somehow or another we know it's there and we search for it. Well, I don't know quite what to make of this note of Michaela's. Perhaps it means nothing. Perhaps it was motivated by something she read or heard somewhere -- in church, in books, on TV -- and perhaps it is nothing more than that. But to go to the trouble of writing it down??? That is odd. But it's something that I've seen happen in the aftermath of Michaela's loss. 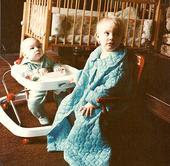 When Robbie was nine years old I was looking for something and came across his baby book. Inside it was a drawing Michaela had done of Robbie, and a note that said, "For Robbie when he is 9 years old." That's how old Michaela was when he was born, of course, and she'd written a little bit about it. But it was such a synchronous event, it had to have meaning. 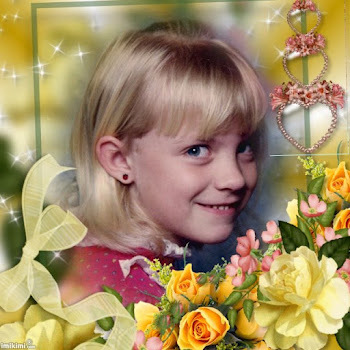 When my youngest daughter was born, the world was acknowledging the loss of another girl who had been kidnapped and murdered, Polly Klaas. We had her memorial service on in the labor and delivery suite. I'd chosen to do that, not only in honor of Polly, but in some acknowledgement that birth and embracing of love is in the end also an embracing of loss. But my daughter was actually born just as the memorial service was ending, and literally as the midwife was preparing to deliver Johnna, I looked up at the television in the corner of the room, and there was Michaela smiling down at me. Again, what does it mean? I can guess, surmise, assume, but one thing I have concluded about all things that are spiritual in nature is that in this lifetime, I will never know. The only thing that I can absolutely and positively take out of the string of synchronicities over the last 23 years is that Michaela is still speaking to me. Through her poems, through her drawings, through her notes, through things that just pop up at exactly the right moment, she is telling me that she is not gone. She is here, with me, alive in my heart, forever alive in my heart. She changed me, changed my life, changed my very identity at the moment she was born, and she continues to do so even now. She does not have to have passed on in order for this to be true. The bond between our hearts and souls could well be strong enough for the link to remain strong through all the years we have been lost to one another. I think about the line in her poem, "they think it's real, the dreams you have, the dreams they feel." How can that line be interpreted, except as a statement of the direct link between minds and hearts? There are a couple of really strong leads in Michaela's case, which the investigators are hoping to be able to get to the bottom of in the next few months. One of those leads to a likelihood of Michaela being alive. One leads to the likelihood of her having been killed. Might this note be a preparation of my heart to be able to accept the latter? Perhaps. Letting go is so difficult. When my mother died, she had been sick for a long time. She'd been in the hospital for three days, most of that time at least unresponsive, and I don't know whether she was aware of her surroundings or not. During most of those three days I sat and held her hand and sobbed and cried and soaked her with gallons of tears. Finally, I held her hand and whispered to her that if she wanted to go, it was okay, that she would always be with me in my heart, and I didn't want her to suffer any longer. I sat down and picked up one of my mother's crossword puzzle books, started trying to work a word puzzle, but within minutes I was aware of a change in the room. I looked over and saw that my mother had stopped breathing. Had she just needed my permission to leave? 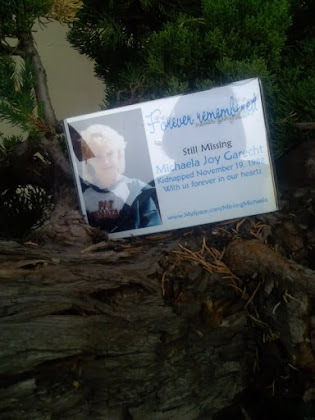 Could it be that in all these years the truth of what happened to Michaela has eluded us because God, the universe, or Michaela, knew that I was not able to face it? Could that note be a message from Michaela to prepare my heart? Honestly, if she was killed, as terrible as that is, I do know that she didn't cease to exist. I do know that our souls are locked together and we will hold each other again. If she had died 23 years ago, then I do believe that this would mean that she had spent the last 23 years in a much better place than the place she would have been in here for all that time. Well, maybe. I would suspect that Jaycee Dugard would disagree. Maybe it's not really just my selfishness that makes me want her to come home to me. On the other hand, I've heard snippets of people talking about how you only reach freedom when you can come to accept loss. As long as you fear loss and death, you will live as a slave to that fear. Only when you embrace your death and the fact of loss of your loved ones will you be able to fully embrace life and love. This is a difficult concept to fathom. I understand it completely. I even agree with it. But that fear lies deep in the roots of the human heart, and the thought of even attempting to eradicate it is terrifying -- because in order to do that, you have to actually face it. You have to actually acknowledge that eventually, you will lose or be lost to everyone you love. You have to look at it, look at them, and let it go. Letting go is hard. I have learned a little bit about it, just in my children growing up. The first times they have taken car keys and left the house, I've had to let them go. In this you can plainly see the truth of this lesson -- if you live in fear of death, you cannot live. If the fear of death controls you, how many things will you not do because of that fear, and how much less will you live because of that? If you live in fear of the loss of love, you will be far less able to embrace love when it comes along. In fact, this is the precise theme of the novel I am writing. I know it, I understand it. I act on it, and yet there is a depth of work that I haven't attempted. I have gotten as far as being able to close my eyes to it, but I haven't gotten to the point of being able to look in its face. I will never stop looking for Michaela. I will never, ever stop loving Michaela. I will never, never, ever stop shining her light into the farthest corners of the earth. Whether she is alive, or whether she is not, she is still here. She is still speaking to me. And with that knowledge I will face the future and be prepared to accept the truth, because whatever it is, it will never, ever take my daughter from me. There isn't a thought I could write nor a word I could speak to respond to or expound on your perfect blog. Don't argue with me it was perfect and my tears are flowing. Sharon, So powerful, touching the center of my heart and soul. Tears like a waterfall cascading down as I read. It was perfectly written Sharon. WOW. Your words completely say it all. I want to say "something", Sharon, but I find myself speechless. This is just surreal! As many times as I've heard Michaela's story, I found myself having to read a couple paragraphs then walking away. Your words are so very powerful. As always, sending hugs your way. Sharon, I have followed you and your story for so long and with each blog, I ride the rollercoaster with you, though obviously never near the pain you have experienced. On one hand, I constantly want to keep hope alive and I ride along with you when the undertone leans more toward her being alive out there somewhere, then on the other hand, I just want answers for you, no matter what the outcome. I try to put myself in your shoes as best as I can and since becoming a mother myself, your pain is even more real to me, though again, impossible to compare. I feel very strongly that you are right about next year, I just feel it. I guess because your writing always makes me feel what you are feeling. I am still hoping for you and I think of you and your family everyday and I hope for the very best for you and your family, especially Michaela. In the end, my answer is always the same, it just isn't fair that anyone should experience anything like this ever. I hope you find resolution. Mary, I feel as though I should apologize if I am making you feel what I feel! But thank you, and thank all of you, for bearing with me, and for bearing with Michaela. I know the love emanating even from people I have never met, even people who have never spoken it to me, is part of what has kept me afloat over all these years. you are so strong and brave, where ever Michaela is she will be very proud of you. I pray these leads give positive results and we will be reading a 'Michaela Joy Garecht found safe' facebook page. Your words are truly beautiful Sharon. I always feel a strong connection to Michaela's story. I think it's because she was kidnapped just 3 days after my 10 birthday and also because I have a daughter named Michaela. Even spelled the same way which is something I don't see often. I chose that spelling because my daughter is half mexican and in spanish that spelling means Michelle, so she's named after me. Whenever I read anything you write about Michaela it makes me so thankful that I still have my Michaela but so sad that you don't have your Michaela or any answers as to what happened to her. I always say a prayer for you that you find her and she will be alive and okay. 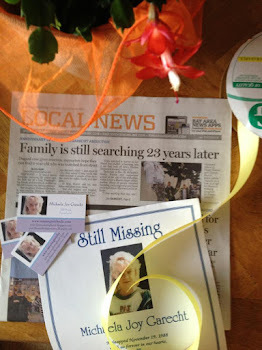 I hope that you will find the answers to her disappearance soon. I also want to say that I too believe she is still speaking to you. There are too many coincidences for it not to be her on some spiritual level. I hope that her letter does mean that you're going to find out what happened and I sincerely hope it end happily for you and her. I will continue to pray for you and for Michaela. That was an amazing blog and it really made me think. Reading these notes and poems of Michaela's is very interesting. They seem significant, but how I dont know. I truly pray that the lead they are working on brings Michaela home safe. The poem is so interesting about the doors of steel, and then what you said about not wanting to be alone in the bathroom....a small room. One thing that has made me think over the years is that I dont know of any other kidnapping like this. 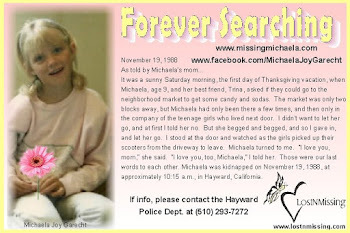 If the kidnapper didnt plan on keeping Michaela alive like Jaycee....then why are there no similar kidnappings. again I may be wrong, but to my knowledge other children were not taken in this manner, by a suspect who looked similar. The bold way he took Michaela in broad daylight, shows a recklessness that I would think would be repeated, unless it was a one time thing and he has kept her all these years. if she wasnt alive, the profile would be logical that he would do this many times over. Sorry to have rambled on, just some random thoughts I had. I was sorry I missed the anniversary on Sat. I almost made it to hear Robbie sing, I even got to the parking lot and got an emergency call and had to leave right away. I did see the tree/bush that all of you made pretty in her honor. Sharon you write so beautifully. Sometimes it is hard for me to read, it brings back some of the feelings of fear and confusion from 23 years ago. I am amazed at how you are able to look at things. So calmly and with such an introspective eye. I can't help but carry the fear with me from it. I do understand what you are saying about living though. But all I can think of when you describe her looking up at you, amused with herself due to your disbelief of her poem, is Lauren's face looking up at me facing the same possibilities. That scares me more than anything in the world. All I know is you are an amazing woman, stronger than anyone I have ever known. And I know you will never give up or stop looking. And I will always be here for and with you, praying for her to come home. I agree with Michelle above. When I read your blog the other day I just thought....wow. To be honest I have already been amazed at the coincidences up to this point. The poem she wrote and the letter at age 9 to her brother are unusual enough. Now this. Perhaps what motivated her to write it 23 years ago is not so relavant. What is relavant is that her words were meant to eventually reach you. Tucked away in that book all those years and meant to find their way to you some day. Same as the drawing and note to your son. Again, very odd for a little girl to think beyond herself and create something for her little brother's future. On a concious level she may not have been aware of her reasons for doing it. The important thing is that this drawing was supposed to be in place so that it could be found for Robbie years later. A larger force at work that through Michaela prepared these items for your family to find one day. Hope this makes sense. I would love to have your gift of writing. Sometimes I know what I want to say but have trouble executing my thoughts. I understand exactly what you mean, Leslie, and I agree with you completely. It's amazing and humbling to see such a greater force at work in our lives, and at work in my little girl's heart. Sharon, I have to say the things you tell us about Michaela, she was truly, truly, truly a very special little girl...I don't know any 9 year old like this. Who has the thoughts she had, who could write the way she does. Even the way she left these messages for you, the picture, the poem, this note. For you to have found this note, wow...I'm sure your heart must have skipped a few beats. I just feel like she wasn't a normal, everyday child. She was special, some kind of an Angel? I don't know but I feel like she was one of God's extra special creations. Nearly everyday I ask why haven't they found her. Where is she? No body...not even a sighting . I keep hoping one day it will be all over the news that she was found. It is so strange that nothing has come of it. No one caught the plates as the car was racing down the highway,it didn't hit other cars or cops didn't chase it? Couldn't they have looked up every car that matched that description around that area? Even it there a thousand just like it??? Why hasn't she found? Yes, anonymous, but that is because a diagnosed schizophrenic used a color sketch done for Michaela's case by a police artist's wife. The key word is "sketch." They are using our sketch. That is not the same as "person." 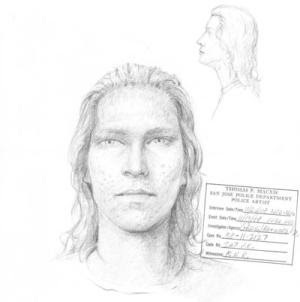 In fact, the police officer's wife did the color sketch on her own, without any input from the eyewitness, and our eyewitness has said that the color composite is NOT an accurate representation of the man she saw taking Michaela. Sadly, there is a lot of misinformation floating around in the Johnny Gosch case. This is one bit of it. Oh believe me, I've seen it all and I've read the books that came out of it, like the Franklin Conspiracy. But there are some definite falsehoods being spread around about things I know the truth about, and once that happens it just ruins their credibility with regard to everything else. Like I said, it's a sad, sad situation. To the second anonymous, if you don't mind I just honestly don't want to get into that subject. If you wanted to e-mail me personally at sharon.murch@gmail.com, I would be happy to answer you though. 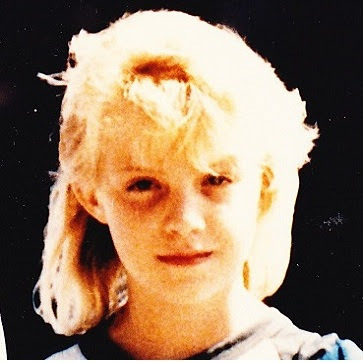 Hello, Michaela is my age, I am 31 years old as Michaela is also, and when I read this post I went back to my own childhood and honestly it is not something I would have even thought about, I dont think it is something a little girl would think about it in that way in which Michaela wrote. I mean we think about heaven and that God lives there and also that people go to heaven, but the way she wrote it, who she was actually expecting to see. It gets you thinking... maybe she did know something was going to happen like you yourself have said. I didnt know her but from her writing she sounds like she was a very sweet little girl. My heart goes out to you, I am very sorry for what you have had to live. Time for a new blog. You haven't written in a while. Wishing and praying this holiday brings some measure of peace and quiet to you Sharon. A 5 year old named Isabella Tennant left a voicemail message for her mother 2 weeks before she was murdered by a neighbor earlier this month. The message was: "Mom, if I want to be alive, I want to be like you." The mom didn't get to the voicemail message until after the body was found. I just heard it on the news and thought about Michaela's poem about the trip to heaven. This is an odd question about “The people knock on doors of steel” writing but there is a specific reason. Did Michaela hear about confessionals or attend a Catholic church service while still with you?? I ask because I have read her poem for years with the idea of it being soley her view of a kidnapped persons experience. Last night the line about “kneel ” struck me differently & the uses of “doors” and….”believe”. When I was a child I was raised a Catholic and observed the members (and later myself) ‘go to confession”. (enter in the door, kneel –the sliding inner door of steel mesh between priest and confessing member opening and closing-having to confess something which for some kids “they think of things that aren’t real” to fulfill the obligation..etc). . The other post it writing ‘I am packing for a trip” exhibits such spiritual confidence and unwavering expectations that many adults never reach! 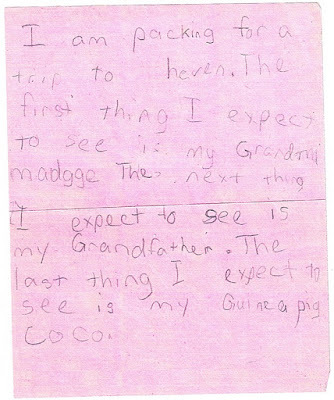 With such extensive creative writing skills in your family Do you think there is any possibility Michaela, in the kidnap writing, was trying to also include her personal spiritual views ???? No, Michaela was not familiar with the Catholic Church. She specifically said it was about people who had been kidnapped and were being held captive. Behind the doors of steel has always meant to me something impenetrable, impossible to break down. Kneeling, could be praying. She was famiar with prayer although I don't know about the kneeling.